A major challenge in the war against cancer is to find ways to diagnose and treat the disease at an early stage. Cancer occurs through a multistage process where cells are transformed to malignant tumors. Of essence is to discover the tumor at an early stage where the cancer is still curable. This calls for sensitive and effective diagnostic tools that can sense the cellular state early in the process. In GlycoImaging we will address this need while exploiting novel synthetic probes targeting tumor specific glycans. These “plastic antibodies” will be developed and used for real-time visualization of cellular cancer biomarkers and in low-cost clinical diagnostics. 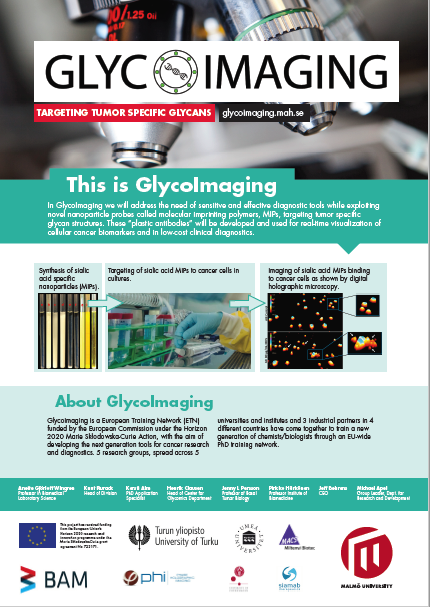 GlycoImaging will aim to develop and implement highly promising glycan specific probes in clinically relevant cancer diagnostics technologies. We will develop glycan-specific nanoprobes alongside digital holography for real-time visualization of cancer biomarkers and use in low-cost clinical diagnostics, glycan-specific cell separations and in life science and education. By matching polymer/materials research groups with leading molecular biologists and diagnostics institutes together with SMEs and a leading diagnostic company we have created a highly interdisciplinary research-training network with ambitious scientific goals and an attractive training program. In GlycoImaging we will show that very specific and defined reagents, in the form of molecularly imprinted polymers (MIPs) or “plastic antibodies” combined with innovative imaging technologies can fill an unmet need in oncology. Being of nonbiological origin, engineered MIPs are extremely robust, resist denaturing solvents and high temperatures and can be reproducibly produced at low cost. Being devoid of the limitations of antibodies and lectins MIPs can potentially overcome many of the problems in the current detection strategies. Recent reports on “plastic antibodies” mimicking antibodies with respect to both size and antigen binding in vitro and in vivo were met with particular excitement. Independent reports have shown that the technology may now offer the much needed breakthrough in the field of glycan specific detection. This warrants the further development of such receptors, which could be used for e.g. cell imaging, cell sorting, cellular glycosylation analysis or for the selective inhibition of cell surface interactions. This project has received funding from the European Union’s Horizon 2020 research and innovation programme under the Marie Skłodowska-Curie grant agreement No 721297.